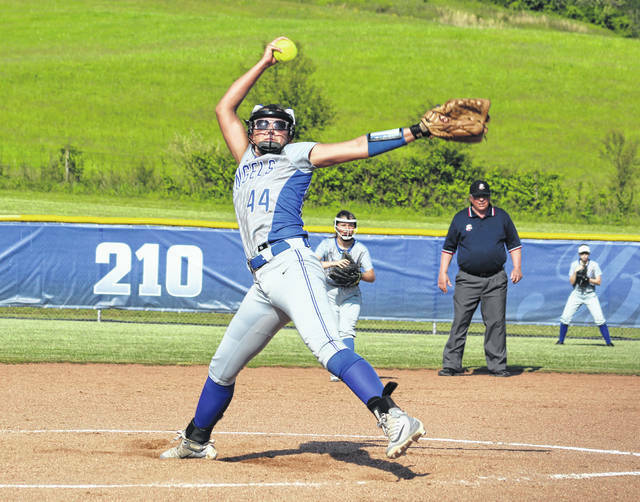 Gallia Academy junior Hunter Copley (44) releases a pitch during a Division II sectional softball final against Unioto on May 9 in Centenary, Ohio. CENTENARY, Ohio — The historic season went well rewarded. The Gallia Academy softball team — after sharing its first-ever Ohio Valley Conference championship with Coal Grove — had six players chosen to the All-OVC squad for the program’s efforts during the 2018 campaign. The Blue Angels (18-6) — who went 11-3 in conference and also advanced to the district semifinals — had four first team representatives and two honorable mention selections. GAHS also had half of its recipients earn repeat all-league honors. Junior pitcher Hunter Copley, sophomore shortstop Alex Barnes, freshman outfielder Bailie Young and freshman catcher Ryelee Sipple were individually named to the first team. Sophomore third baseman Bailey Meadows and freshman outfielder Chasity Adams were the honorable mention choices on behalf of the Blue and White. Copley was a first team recipient on the 2017 All-OVC squad, while Barnes and Meadows were honorable mention selections a year ago. The complete All-OVC list was never received by any media outlets, therefore only Gallia Academy’s selections were available for this story. The OVC does not select a player of the year and the 2018 coach of the year was unknown as of press time. https://www.mydailytribune.com/wp-content/uploads/sites/42/2018/07/web1_7.15-GA-Copley.jpgGallia Academy junior Hunter Copley (44) releases a pitch during a Division II sectional softball final against Unioto on May 9 in Centenary, Ohio.